Street Fighter fans are rejoicing everywhere, because Capcom's Street Fighter IV has finally made its way onto the iPhone. Unfortunately, its graphics and features won't knock you out, but Capcom ensures you'll want to come back for a few rounds with this initial release. While not a pitch-perfect port of the popular console fighter, Street Fighter IV for the iPhone captures the spirit of the intense one-on-one battles that distinguish the series. Mobile Fireballs: Street Fighter IV impresses by translating many of the defining moments of the series to a new platform. Dedicated fans of the series will likely deride the game for what it’s lacking, so let’s get that out of the way: Street Fighter IV for the iPhone features only eight of the 19 characters—Ryu, Ken, Blanka, Guile, M. Bison, Dhalsim, and Chun-Li from the original Street Fighter II, along with newcomer Abel from Street Fighter IV—and all are available right from the start. This was a bit disappointing, as it’s less than half of the original cast and there are no unlockable characters or levels. The graphics, while impressive for the platform, look more like Street Fighter II than IV—the level of detail and polish of the fighters is lacking, though the cut-scenes keep to the Street Fighter IV graphics. You may be wondering how an arcade/console game that’s tremendously dependent on joystick-maneuvers translates into a touch-screen game—and the answer is, shockingly well. 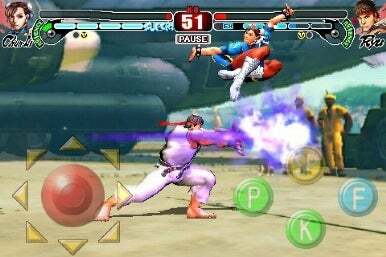 The developers apparently spent months on the controls, ensuring that the unique feel of the combos and attacks could be translated to the iPhone. The large joystick is particularly impressive as its built for the precise movements needed to perform special moves. But the attack buttons are reduced to four buttons: punch, kick, special move, and charge attack. The reduction in the number of buttons is understandable considering the small screen size, but will still likely irritate some purists. Street Fighter veterans will appreciate many original move combinations are preserved—though they may be annoyed at the fact that non-vets such as myself can perform the same tricky moves by hitting the SP (special move) button. Similarly, extra-special super combo and ultra moves can be performed through joystick-maneuvers, or by tapping the meters on the top of the screen. There are two meters at the top of the screen—the “revenge gauge” and the “super combo gauge.” The “revenge gauge” fills up as you take hits, while the “super combo gauge” fills up as you make hits. Once they’re full (or, mostly), you can simply tap them to perform some pretty deadly moves. While I can appreciate the time and skill it takes to master the joystick controls, the SP button and revenge/super combo gauges are a nice touch—as the virtual joystick is pretty good, but it’s not that good. These little shortcuts, while kind of like cheating, keep the game from getting frustrating. There are several modes to keep you occupied, though only the Bluetooth multiplayer holds a lasting draw. Solo play options include tournament, free-sparring, dojo, and a training room. The tournament mode is disappointingly quick and uncreative—the entire thing took me about ten minutes to play through and the ending is the same for each character. There’s no save function, so if you leave the game, you’ll have to start over again. The dojo is a training session—great if you’re a newbie, or if you just need some time to get used to the non-physical controls. Free-sparring features one-on-one battles with a computer, and the training room is like free-sparring in which the computer doesn’t fight back. By far, the most alluring feature of Street Fighter IV for the iPhone is the multiplayer mode. As of right now (let’s cross our fingers for an update), the game only supports Bluetooth multiplayer. Multiplayer (or “Versus”) mode runs smoothly and quickly, with virtually no lag—even when I was playing on my 3G against a 3GS. The only problem I ran into was a lack of opponents—after all, the game is $10—so an online multiplayer mode would be a particularly nice option. Street Fighter IV is easily the best fighting game I’ve played on the iPhone, but it lacks depth for a $10 game. As I mentioned above, only half of the original roster is here, there are no unlockable levels or characters, there’s no save function, the controls have been simplified, and the tournament mode is unfortunately quick. Capcom did spend a lot of time—and it show—on the controls and the multiplayer mode, and I’d argue that this makes up for the lack of interesting solo play (who really wants to play Street Fighter alone, anyway?). But we should expect a bigger online multiplayer mode and a more robust cast of characters. Without these features, Street Fighter IV feels incomplete. That said, Street Fighter IV is a fun game—whether you’ve played the original or not—and sells for only a fraction of the console-game price. If you have a network of avid iPhone gamers who will drop the $10 with you, I’d say this game is absolutely worth it. If not, then you might want to wait for an update that expands the multiplayer or offers more robust single-player features.